Five contestants were nominated for elimination from Star Maa's reality TV show Bigg Boss Telugu 2 and finally, Nani showed doors to Kireeti, while Geetha Madhuri and Ganesh were saved from eviction in the third week. Actor Kireeti Damaraju has been eliminated from Bigg Boss Telugu 2 house in the third week, while made singer Geetha Madhuri and Ganesh from eviction from Star Maa's hit reality TV show. Five housemates — Tejaswi Madivada, Bhanu Sree, Kireeti, Geetha Madhuri and Ganesh – have been nominated for elimination from the Bigg Boss Telugu 2 house. In Saturday episode, Nani revealed that Tejaswi and Bhanu are protected from the eviction and one among remaining three will be shown doors on Sunday. 9.10 PM: Nani is on the stage of Bigg Boss Telugu 2 and started addressing the housemates. He has given a fun task named Yes or No to them and they are enjoying it. 9.55 PM: Fun task ended on happy note. It is time for elimination. Geetha Madhuri is protected from the eviction. Ganesh and Kireeti are in Danger zone. 10.00 PM: As IBTimes predicted, Kireeti has been evicted from the show. Nani asks him to pack his bag and get out of the house. Housemates bid him good bye. 10.40 PM: Kireeti was very emotional when he addressed the inmates. Even the housemates were also emotional to talk to him as they sorted out their issues with him. Finally, Nani wished him good and bid him good bye. On the other hand, there was a strange buzz doing the rounds on the social media and it was not clear who started it. But it claimed that Bigg Boss Telugu 2 would not have an elimination. Many were upset with this news and blasted the bosses of Star Maa for wasting their time. Here are some of Twitter comments. 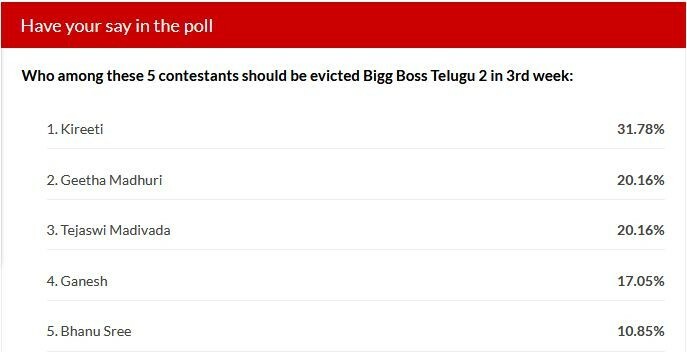 @StarMaa @NameisNani #BiggBossTelugu2 if at all there is no elimination today, might be #ganesh got more votes than #kireeti. They don't want to eliminate so called celebrity even if they get lesser votes than a comman man like #Ganesh. #biggbosstelugu2 Fully biased show. No elimination today. #Nani you completely lost respect with your partiality.